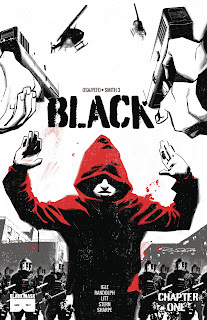 The Fellowship was fortunate enough to obtain a copy of BLACK #1 from Black Mask Studios. Kwanza Osajyefo writes, Tim Smith 3 designs, Jamal Igle illustrates, and Dave Sharpe letters. Kareem is a New York kid in the wrong place at the wrong time. Or maybe the right time. Either way, he’s the victim of a cop shooting. But he’s not dead. Oh, he was hit several times, but somehow survived and escaped the hospital. As the cops are about to capture him, he’s given another option, and an explanation (or the start of one) for what’s really going on. Put simply, Kareem is a super. And only half a percent of African-Americans can make that claim, whereas no other “race” has had a single manifestation. So this is a story about a major shift in the power paradigm. What this might mean to one black teenager is anybody’s guess, and in this case is the beginning of a very interesting story. I love the use of black & white in general, and in this book the crispness of the line work is especially nice. The idea of a story based on race and power is not new, but this is a good time for that kind of discussion. I look forward to where this book will go and how it will take us there. 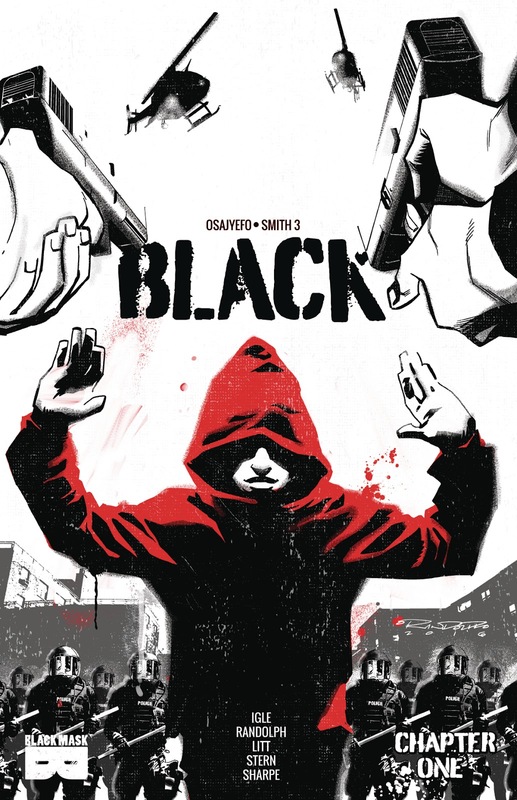 BLACK #1 is available now at your FLCS or at blackmaskstudios.com.